Last night my friend Marcelo and I made orecchiette for Christmas Eve dinner. I roped Marcelo into making the pasta with me since individually crafting each piece of pasta is a bit time consuming if done alone. I made a simple pasta dough from semolina, high-gluten flour, and water; nothing else. After working the dough on the counter, we rolled it out, sliced it up, and pressed out a whole bunch of orecchiettes. 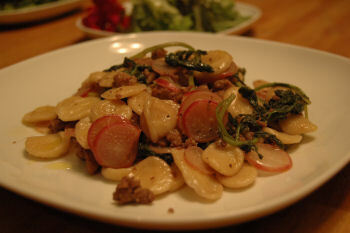 The recipe I came up with used radish tops, sauteed radishes, and Italian sausage. “Cooked radishes?” you say? I thought the exact same thing when I made this in the past using penne pasta and omitting the sausage. 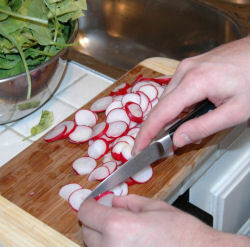 The radishes take on an almost turnip flavor, much more mellow than their raw counterparts. The greens aren’t anything new and taste very much like spinach. A little bit of olive oil and red wine holds the whole dish together. While the water is coming to a boil, cook sausage in 3 tablespoons of olive oil until lightly browned. 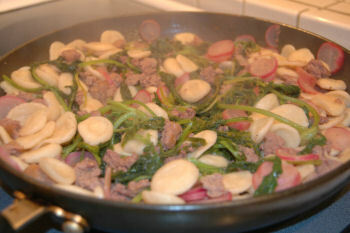 Add radishes and greens and stir into sausage. Reduce heat to low and simmer for 5 minutes to blend flavors. Add cooked pasta to sausage and radish mixture and add red wine. Simmer for a few more minutes to combine flavors. Add the remaining olive oil and correct seasonings. Oishi, the flavor and the texture of this dish was excelent.